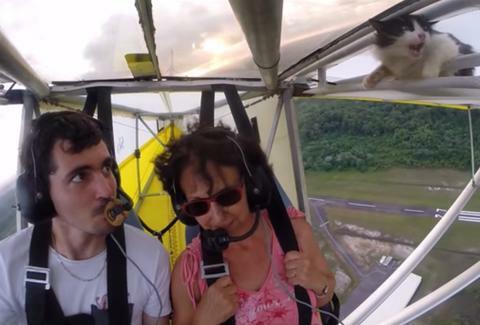 The hilarious video above was recorded by Romain Jantot, a member of the ULM Flying Club in Kourou, French Guiana, and captures the moment when a cat crawls out of its hiding place inside the left wing of his ultra-light aircraft as he flies it hundreds of feet above the ground. It's basically William Shatner's worst nightmare. The cat, a longtime mascot of the flying club -- who apparently made a habit of taking naps in this spot -- somehow managed to stay clung to the wing until Jantot brought his plane back down to the tarmac. It's a pretty safe bet that the airborne fur ball will probably find somewhere else to spend its downtime, though.